the truck falls through the ground (until the chassis box collides with the ground) but the wheel colliders (the physical, not optical ones) are still are still "standing" on the ground. 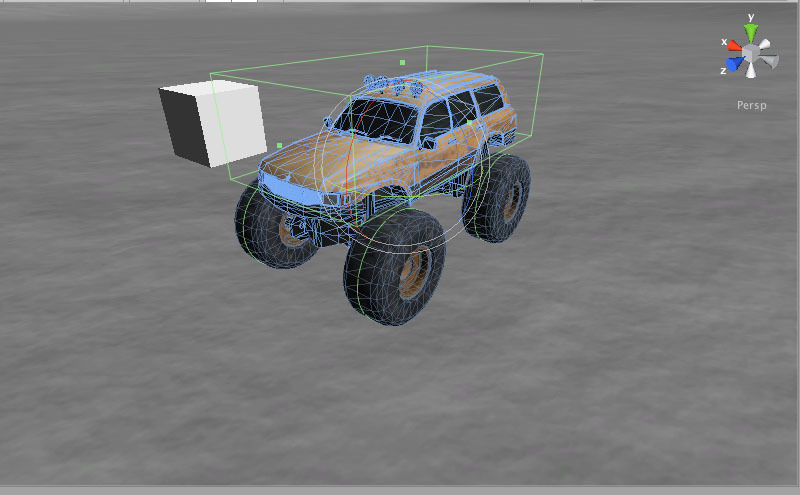 But how can I connect these :X In a video, it looked like this would automatically work if the wheel colliders are child objects of the chassis objects but that's not the case. What is your transform hierarchy? How many rigidbodies are there in there? No, I've decided. (Sorry about the deleted posts). Make sure the wheels don't have rigidbodies, and then make all four wheels transform children of the body. It works just like any other compound collider, only with weird physics on the end. Awh, thanks! that error message stating that the wheels need rigid bodies tricked me into thinking I'd have to attach rigidBodies to every object with a wheelCollider but it actually meant that it required the chassis to have a rigid body (which I created afterwards). I did exactly the same thing, 5 rigidbodies on peered objects. I got it working okay, but wanted to teleport the whole thing. And teleporting objects with joints creates freakiness! Now have a chassis with a box, and 4 child objects with wheel colliders and no rigid bodies. Had rigid body componentes on all wheels too, thanks.